remember Argos is now part of Sainsbury's. So you can now use your Argos Card in Sainsbury’s stores for Normal Credit* purchases at your standard contractual interest rate. Buy Now, Pay Later is not available on Sainsbury’s purchases, but you can still use your card for Normal Credit. So how does ‘Normal Credit’ work? Just like a credit card, you can shop using your Argos Card in Sainsbury’s stores or at Argos and you don’t have to pay anything straight away. As long as you pay your Normal Credit balance off by the date shown on your next statement, there won’t be any interest charged. 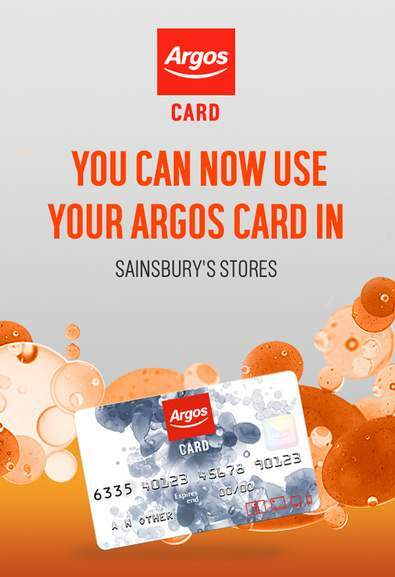 An Argos Card customer can use their Argos Card in Sainsbury’s stores, at staffed and at self-service tills. Argos Card cannot be used for Sainsbury’s online purchases, purchases on the Sainsbury’s Retail mobile application, for purchases at: Habitat Concessions; Lloyds Pharmacy within Sainsbury’s; Sainsbury’s petrol stations (including the purchasing of fuel or any goods from the Sainsbury’s petrol station convenience stores) or the travel bureaux within Sainsbury’s stores. So this is a credit card that only works in Argos and Sainsbury's? You can use your Argos store card for shopping at Sainsbury’s with your standard APR on purchases but buy now pay later isn’t available. Works just like a standard credit card. Works just like a standard credit card. they are also easier to get than a standard credit card. many people have an argos card but no credit card for various reasons, this just opens the option for buying your groceries etc another way during tight months if you need to. And the APR is horrendous ! Don't do it unless you can pay it off every month , and if you can why use a high interest "store card" in Sainsburys ? Sounds like a too easy way to get your yourself in the mire financially even quicker. Yes, you can use Argos Gift Cards at Argos & Sainsbury's Gift Cards at Sainsbury's. Yes, you can use Argos Gift Cards at Argos & Sainsbury's Gift Cards at …Yes, you can use Argos Gift Cards at Argos & Sainsbury's Gift Cards at Sainsbury's. Yes but what about using Sainsbury's Gift Cards at Sainsbury's/Argos stores via an Argos card ? Does anyone know where in terms and conditions it says that buying in Sainsburys is normal credit and can't be used for buy now pay later plans??? Sister used £60 thinking it was part of buy now pay later but she says it's not in the terms and conditions ? !